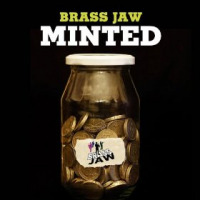 Although Brass Jaw started life in 2005 as a saxophone quartet – of which there are several examples - the five-year-old Scottish group that comprises three saxes and a trumpet may be unique in major-league jazz. The material on their latest recording, Minted, is a rare treat. From the mesmeric minimalism of Talisman Home to the splendour of Lester Gibson Blues, there’s never a dull moment. There are echoes of Lester Bowie’s Brass Fantasy - rather than a saxophone quartet like ROVA or Itchy Fingers – and Brass Jaw’s approach is fresh and wide-ranging. Founder Allon Beauvoisin’s baritone saxophone is a consistently prominent presence. His meaty sound provides a rhythmic bass-line for much of the set; the second track, Always The Last Word, is composed by him and typifies Brass Jaw’s style. The assertive trumpet of Ryan Quigley is perhaps the most dominant sound, while Paul Towndrow on alto sax and Konrad Wiszniewski on tenor play essential harmonic roles and contribute telling solos. When all four musicians coalesce, they create the rare excitement that comes from exactly the right mixture of composition and improvisation. Most of the pieces run to less than four minutes, and pack in complex interweaving lines, moods and textures. It’s occasionally frenetic, but closer scrutiny reveals that a lot of work has gone into delivering variety, pace and balance. Thoughts of “where’s the rhythm section?” simply never occur. Twelve of the fifteen tracks are composed and arranged by members of the group, and those by Towndrow are, for me, the most interesting. Heads Down, Thumbs Up gets things off to a storming start, and the ensemble parts sound as if they are created by a considerably larger group. The angular first part of Propeller Beanie could have accompanied a cartoon film (the piece relates to a character created by the American artist Bill Watterson) and then melds with a calmer secondary theme. Walk Tall is erroneously shown on the sleeve also as a Towndrow composition; his arrangement of Joe Zawinul’s tune is majestic and greasy. There are two other “covers”: bassist Bobby Tucker’s Comin’ Home Baby, which often begins Brass Jaw’s live performances, appears mid-set. Sunny by Bobby Hebb can be drearily middle-of-the-road, but here an original treatment gives it a boost. Beauvoisin’s Pulling a Quigley is an affectionate nod to his band-mate’s uncannily good fortune, and the trumpeter’s own I Can Hear Your Smile is more reflective. The impressionistic Little Allegory is inspired by an idyllic country scene painted by Scottish artist Adrian Wiszniewski, who is the tenor player/composer’s uncle. A “fade-in” – created by the state-of-the-art masterstroke of the musicians starting further from the microphones - begins the closing Charles Franklin Blues. The title refers to a fictional character whose name is an amalgam of Charles Mingus and Aretha Franklin, and Towndrow’s tune is dedicated to the legendary soul singer. The addition of trombonist Michael Owers makes this the first-ever five-piece incarnation of Brass Jaw. It sounds like the album was fun to make, and it’s hugely entertaining to listen to.